N.B. 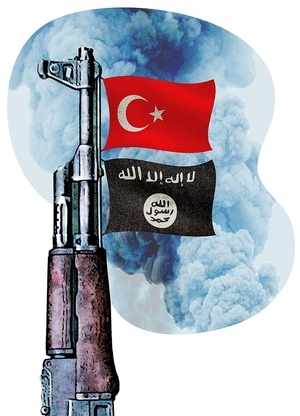 Washington Times title: "Turkey's support for ISIS Islamist terrorists. 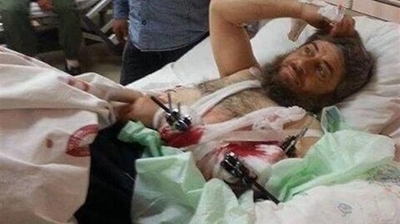 Aiding jihadists could put Ankara at odds with Iran"
Abu Muhammad of ISIS in Hatay State Hospital in April 2014, recovering from wounds received fighting in Syria. 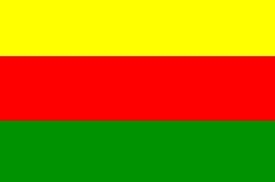 The flag of Rojava, or Syria Kurdistan. 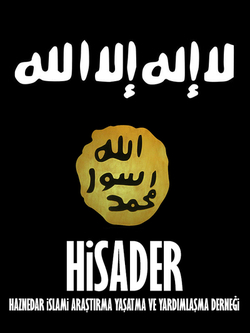 An Istanbul-based charity (acronym: HİSADER) has adopted the ISIS logo with the Islamic statement of faith. June 18, 2014 addendum: I follow up with more evidence at a weblog entry, "More on Turkish Support for ISIS."